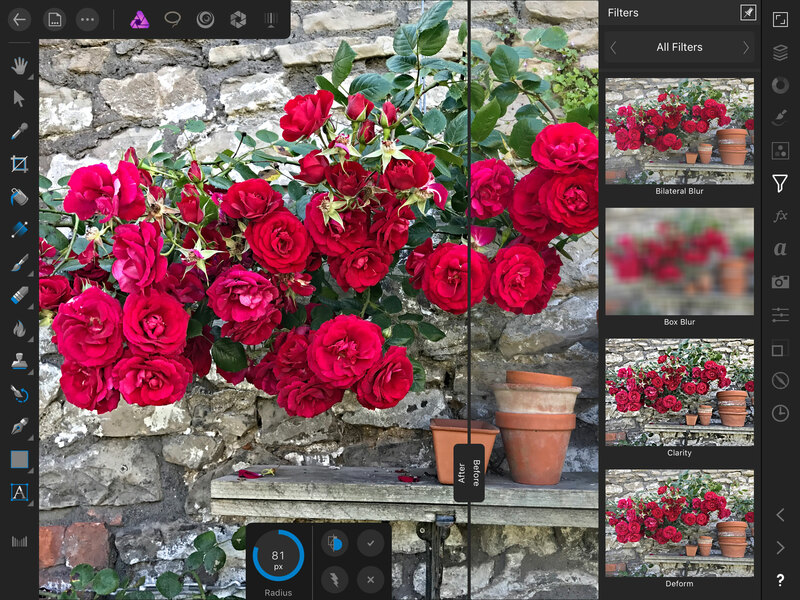 Affinity Photo, Serif’s professional photo-editing application, is now available for the iPad. 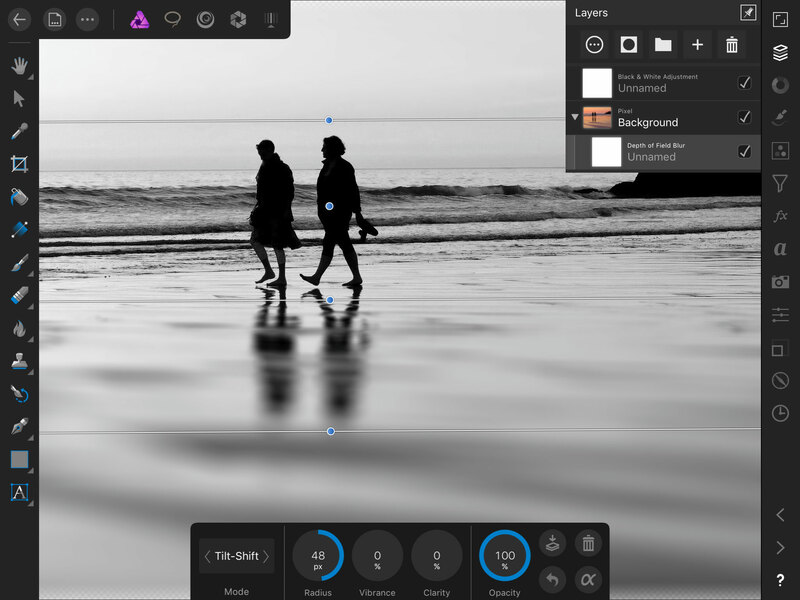 It’s not the first time a software publisher has produced a mobile version of a desktop application – take Photoshop Express and Lightroom Mobile, for example – but this time it’s different. 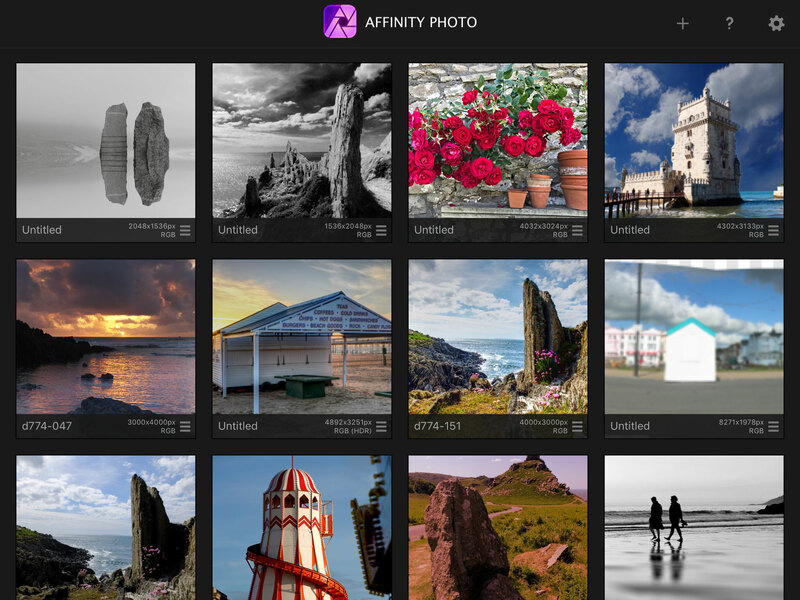 Affinity Photo for iPad is not a simplified, cut-down accessory app – it’s a full-blown version of the desktop Affinity Photo application with every feature intact and optimised for the iPad hardware and touch interface. That’s a bold ambition no other publisher has attempted. Can Serif really reproduce a full-size desktop application within the screen size, interface and hardware limitations of a tablet? It doesn’t just think so, it’s gone ahead and done it. According to Serif, Affinity Photo for iPad has been fully optimised for the iPad hardware and interface. The company says it’s been built from the same back-end as the desktop version but every tool, panel and control has been ‘completely re-imagined’ for the iPad. All the rendering, adjustments and filter effects are fully hardware-accelerated using Apple’s Metal graphics rendering processes for high performance. It even supports the Apple Pencil for pinpoint control if the regular touch-screen interaction proves just to blunt for small and delicate adjustments. Affinity Photo for iPad is compatible with the iPad Air 2, iPad 2017 and all three sizes of iPad Pro – 9.7-inch, 10.5-inch and 12.9-inch. It’s currently from the Apple App Store at an introductory price of £19.99/$19.99. Be aware that it does not work with older iPads. 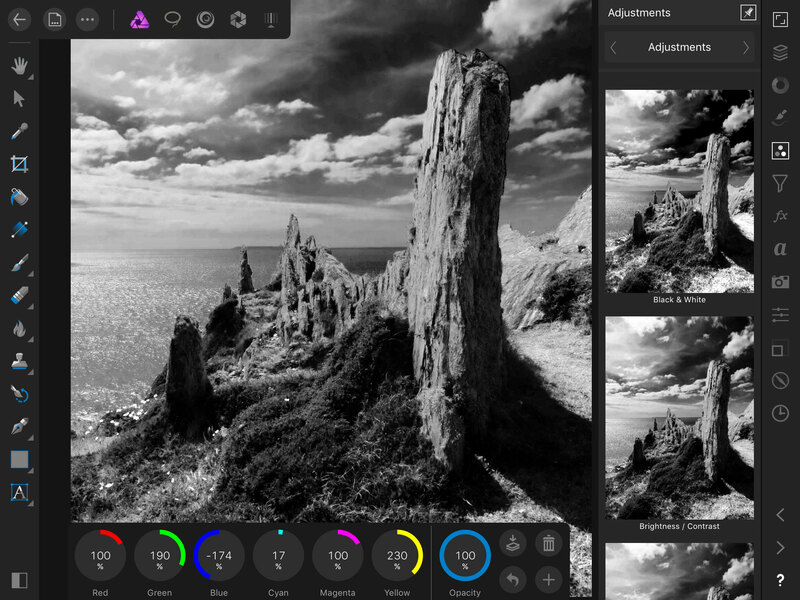 Affinity Photo for iPad is a full-blown image-editor for your tablet with full support for layers, ‘live’ filters, HDR, focus stacking and more. Don’t be fooled by the price. Affinity Photo for iPad is not a budget image effects tool for social media users. 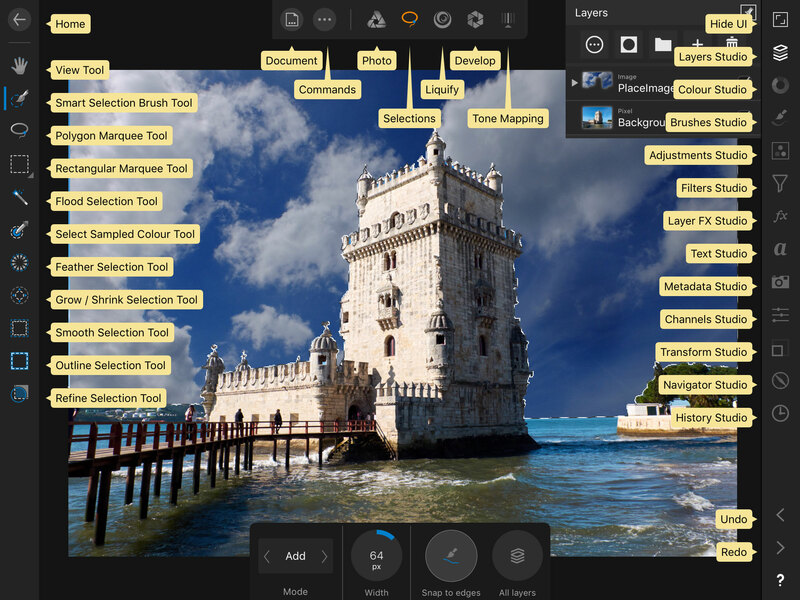 It’s a full-powered, professional image-editor cast from the same mould as Photoshop but without the controversial subscription-based payment system and with the benefit of a ground-up rethink of traditional image-editing processes. It features the same workspace ‘persona’ concept, with a persona (workspace) for regular Photo operations, Selections, Liquify, Develop and Tone Mapping. Down the left side of the screen are the tools available for that particular persona, while on the right side of the screen you’ll find icons for Layers, Colour, Brushes, Adjustments and more. Serif has done a really good job in slimming down the interface for a smaller screen – when you tap the Layers Studio icon, for example, or Filter Studio, a pop-out panel shows you the options and adjustments for that tool, and when you tap on a different icon, you see the options for that one instead. It’s quick, simple and space-efficient. Affinity Photo for iPad uses the available screen space in a very efficient way. If you want to know what any of the icons do, you can press and hold the help button, bottom right, to see pop-up labels. It needs to be, because there is a lot of power built into this app. 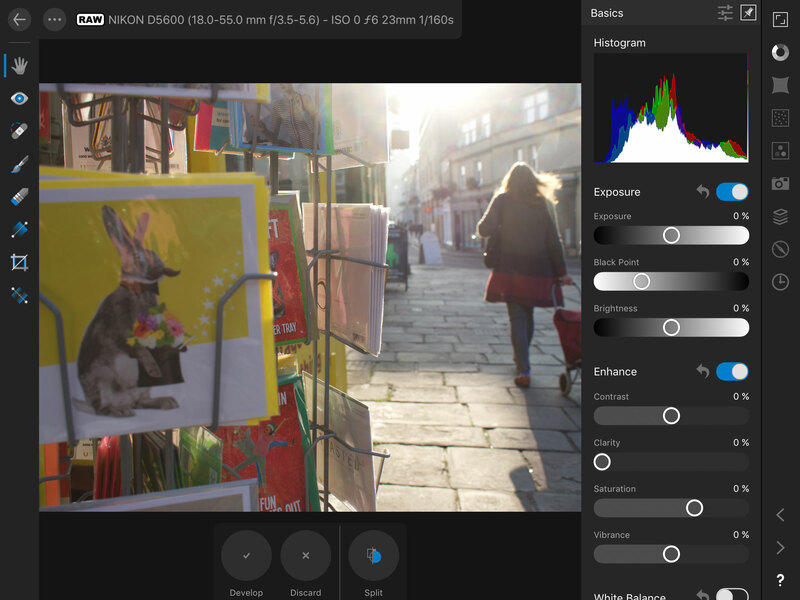 It includes RAW conversion in the Develop persona, 32-bit HDR in the Tone Mapping persona, a Liquify persona, panorama stitching, focus stacking for macro shots and an Inpainting brush for object and blemish removal. The layers system is as powerful and flexible as Photoshop’s, with non-destructive adjustment layers, ‘live’ filter effects for image layers that can be modified later, powerful masking and selection refinement tools, type tools and even vector drawing tools. If your interests and workflow include detailed, technical adjustments to individual images, layered composites, HDR, focus stacking and crossover with illustrative techniques too, then it’s hard to imagine what you might want to do that you can’t do here. It’s not possible in the space available here to examine in depth all the features in Affinity Photo for iPad, any more than with programs like Photoshop or Lightroom. For the record, I’m more of a photographer than a technician. Affinity Photo, like Photoshop, heads in directions I don’t usually go – these days I lean instead towards dedicated plug-ins and effects tools rather than manual processes. But I’ve also spent enough years writing about Photoshop and what it can do to be filled with admiration for what Serif has achieved in this iPad app. The big question for me was how Serif would handle the image workflow. There are two ways you might want to approach this. 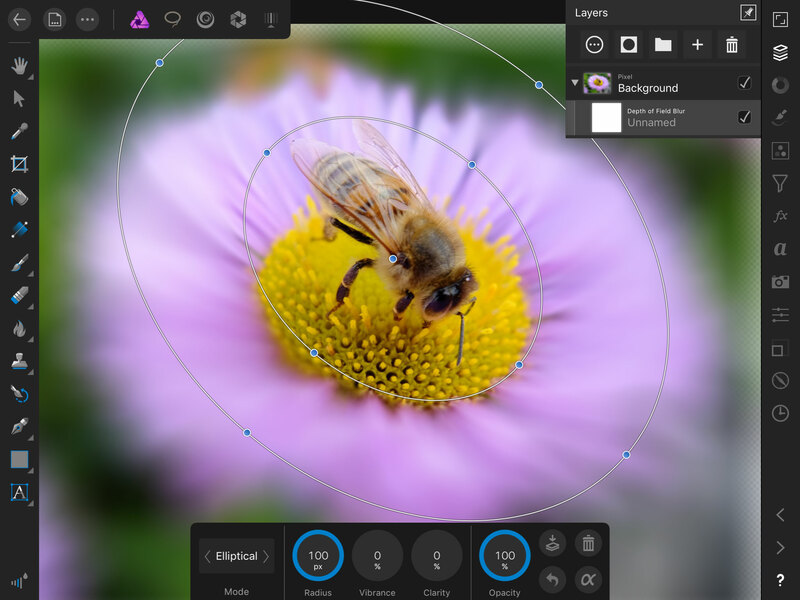 One is to treat your iPad and Affinity Photo as your first stop for image-editing tools. You’ll need to get your photos from the camera to the iPad for this to work, but this is easy enough with a camera that has Wi-Fi, or with an optional plug-in card reader. The limited storage space of the iPad makes them less than ideal as a primary photo storage device, however. Instead, you could just copy across the images you want to work with into the iPad’s Photo library and open them from there. One word of warning (thanks, Michel) – if you’re in the habit of keeping RAW + JPEG versions side by side, Photos will only display the JPEG to Affinity Photo’s ‘Import from Photos’ dialog, not the RAW file. If you want Affinity Photo to open RAW files from Photos, you need to separate your RAW + JPEG pairs (or just not copy the JPEGs into Photos in the first place). The second scenario is that you’ve already got all your photos on your main computer and you’re looking for a portable but powerful way to edit them – and that’s where Affinity Photo really shines. The iPad does not handle file organisation in the same way as a desktop Mac, of course, so how do you get images from one to the other in a quick and efficient way? The answer is simple. Affinity Photo for iPad uses iCloud drive for file transfer. 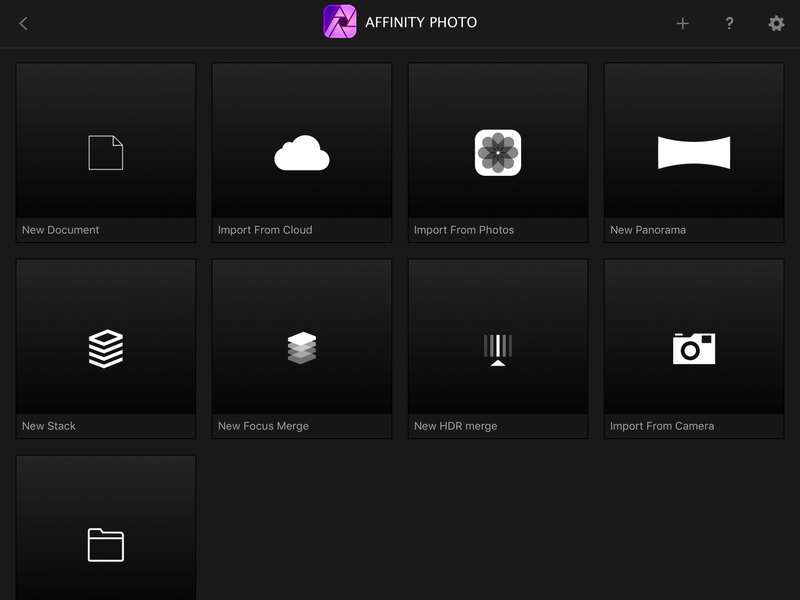 Every Mac owner with an up to date system will have iCloud drive, and every time you open an image for editing in Affinity Photo for iPad, the file is saved to an Affinity Photo folder on iCloud. Back on your desktop machine, you can open these files for further editing, and drag any new photos you want to edit into this folder and they will be available on your iPad, appearing in the Affinity Photo file dialog. If you don’t want to use iCloud, no problem. You can use Dropbox or Google Drive instead. These have the advantage of customisable folder synchronisation, so that your computer’s internal drive doesn’t clog up with everything you’re storing in the cloud. You can share images between your desktop computer and the iPad using iCloud, Dropbox or Google Drive. 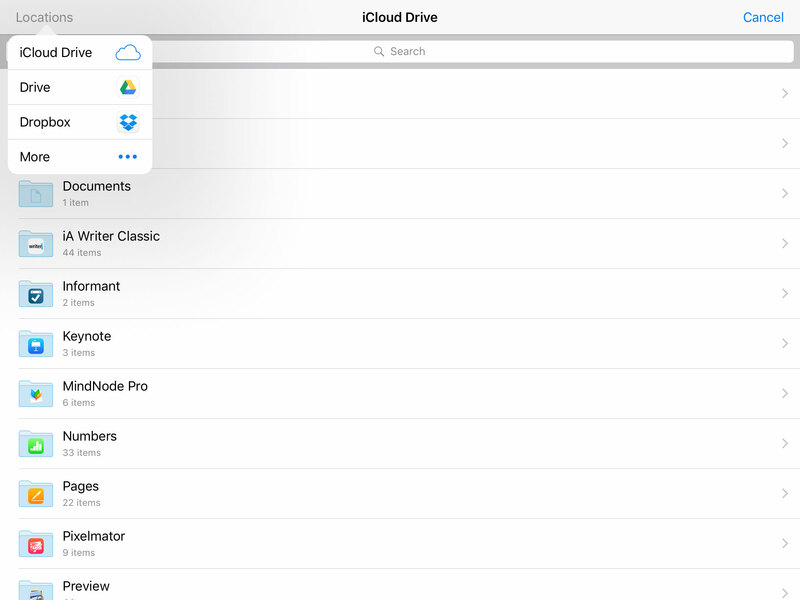 Files can be opened from a variety of sources, including your cloud service and the Photos app, or create a new panorama or HDR merge from scratch. Your images are saved automatically as you work on them and can be browsed and opened from the main ‘home’ screen. 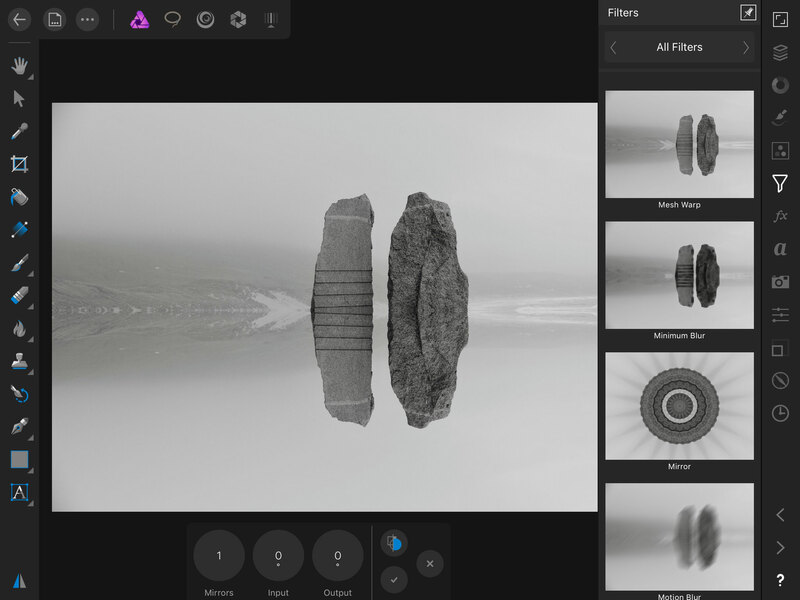 Serif has not yet introduced any image cataloguing or asset management app, so for the time being the workflow will rely on this simple manual sharing system – but many photographers are perfectly happy with this simple way of working anyway. This system does work very well. There’s full file compatibility between the iPad app and the desktop software, and your work is auto-saved as you go along. You can start an editing job on the iPad and finish on the desktop and vice versa. It would be even better, though, if Affinity Photo for iPad was available as an extension to the Photos app on the iPad, like Photoshop Express, for example, or Pixelmator. 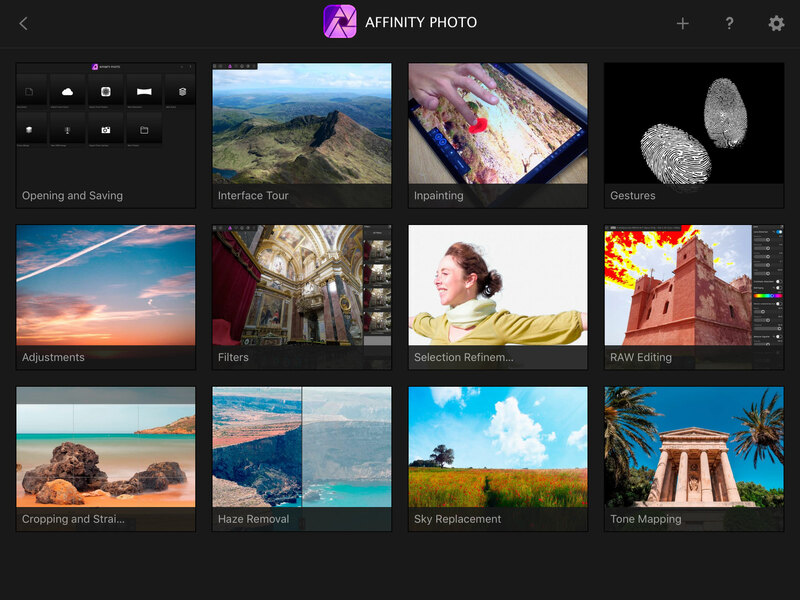 Currently, you can use Photos as a basic image cataloguing tool for Affinity Photo, but you’ll need to launch the app first and then open the Photos library from within that. You can use the Share button in the Export panel to save images back to your Photos library once you’ve finished editing them (thanks for spotting that, Daniel), though it’s a pretty inelegant workaround. 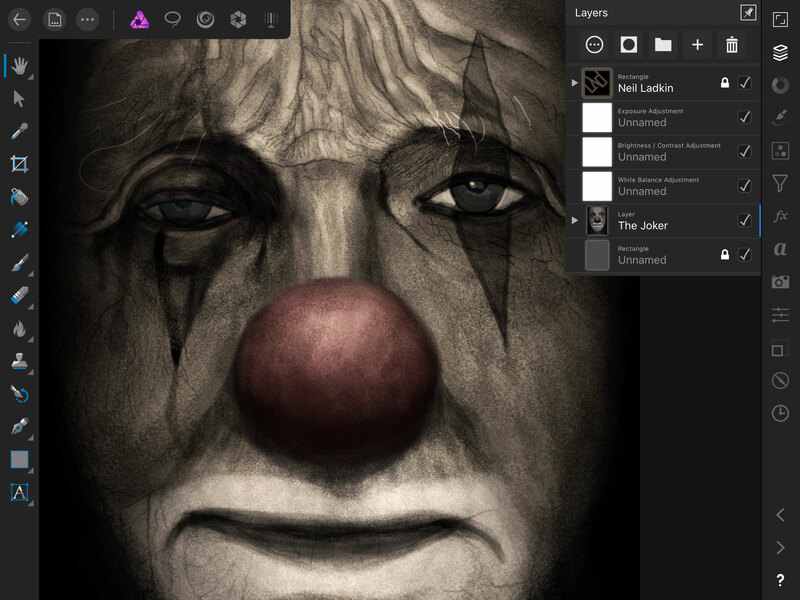 Serif’s rather scary clown face sample image shows the power and sophistication built into its layers system. I used the app on a 9.7-inch iPad Pro with an Apple Pencil. I think it would be better still on a larger iPad Pro, but even on this model there was plenty of room for the image and the interface did not become obtrusive. Here’s an example of how it works. Let’s say you want to apply a retro tilt-shift effect. To add the effect, you tap the Filters button on the right-hand toolbar. This opens up a scrolling panel listing the filters available – with live image previews – and you swipe down to find the one you want and tap it to apply it. The one we want is the Depth of Field Blur filter. This now displays an adjustable blur gadget over the image and a set of controls across the bottom. These include buttons displaying the effect values – you can tap on a button to type in a specific value, or drag left or right to change its value ‘live’ on the image as you drag. Affinity Photo can stack live filter effects with adjustment layers and other image layers in a non-destructive workflow. Incidentally, if you’ve always been tempted to think of the iPad as a low-powered ‘pretend’ computer, you might want to think again. There are no pauses, glitches or hesitation, no jerky redraws – all of the processes we tried worked in real time, super-smooth and lag free. Now we can tap the Adjustments button, choose Recolor (for example) and adjust the layer’s opacity and settings to taste with the draggable Hue, Saturation and Opacity buttons (you can change the layer’s blend mode via the Layers panel). This is just a basic example. Affinity Photo for iPad is capable of much more sophisticated work than this, but it would take some dedicated tutorials to explore these in proper depth. Powerful tonal control in black and white is made easy here – you drag left or right on an area of the image you want to darken or lighten, and colour mixing is done for you. This surreal landscape was generated with the Mirror filter. RAW files open straight into the Develop persona, which does a similar job to Adobe Camera Raw in Photoshop – but is actually integrated into the workflow and remains available throughout. If you’re struggling with the tools, you can check the rather good built-in manual – or browse a set of tutorial videos from within the app. We knew that Serif was working on an iPad version of Affinity Photo, but to see it finished and working so effectively is very impressive. Serif has – somehow – crammed Affinity Photo into the confines of the iPad case without crippling its performance, its features or its usability. It’ll take a while to try out every option and check it against the desktop version, but it looks terrific. It did crash a couple of times on our iPad. Once, the sliders in the Develop module disappeared when opening RAW files, but quitting and restarting the app fixed that. Another time it crashed without warning, but this only happened once and you’d expect glitches like this to be fixed with routine updates. This is the first release version, after all. Serif Affinity Photo for iPad is a specialised tool. It’s not designed to offer quick hipster filters for Facebook or Instagram and it’s not a novice friendly photo-fixer. Affinity Photo for iPad is a flat-out professional tool for photographers who want the same editing power on their tablet as they get on their desktop. As a primary photo editor for images fresh from the camera, it’s not quite there yet, especially if you want to work on RAW files straight away. It does offer a way of ’round-tripping’ images from the Photos app to Affinity Photo and back again via the Share button in the Export window, but it’s easy to miss. For now, it works best as a sidekick to the desktop app, offering easy touch-based editing on a portable device you can use anywhere without any loss of power, features or usability. If you’re into Photoshop-style (we have to mention the ‘P’-word) in-depth technical editing, compositing, masking and illustration, Serif has just brought all of this power to your iPad. Indeed, now that I’ve seen what Serif has done – and what my iPad Pro can do – it’s enough to make me wish I’d bitten the bullet and bought the big 12.9-inch model. It’s not often a piece of software makes you rethink your hardware decisions. Thanks for this review, it has helped me decide to add Affinity to my brand new iPad Pro 10.5″. Thanks for this interesting review ; it made me buy Affinity for iPad ! I understood from your review that you lost the raw format when using a SD card to upload images into Photos. But I observed that if you shoot into RAW + JPEG , then Photo automatically load the jpeg only. When shooting in RAW only, I conserve the RAW format after import in Photos and can load the RAW files into Affinity to start developing in the RAW environment. Thanks, Michel. You’re quite right! It looked like Photos would only pass a JPEG rendition of a RAW file on to Affinity Photo, but my photos were RAW + JPEG pairs. Once I separated them it opened RAW files straight to the develop module. I’m modifying the review to reflect this. Thanks again. Regarding the semi-transparent edges in the depth of field filter, there’s a retain alpha button to make it disappear. Same for other filters that create a blur effect. You’re referring to the desktop version? A little correction: You can save an image in the Photo app going to “Document”, “Export”, “Share” and then save it on the iPad. Thanks for pointing that out. I’ve amended the review. “but many photographers are perfectly happy with this simple way of working anyway.” What photographers do you talk to? This makes the app nearly impossible to work with when we are working with large numbers of photos. It is incredibly frustrating that I wasted money on it. I am not going to sit for hours exporting a photo one at time, and then the exported photo doesn’t even retain its edited file name! So frustrating.